The Alliance Press, Louisville, 1938. Louis Brandeis's copy, the presentation on the front blank--"To Hon. Louis D. Brandeis / with deepest / respect and esteem / James E. Dunne / December 1938", dated the same month as Brandeis noted "[t]he rising indignation over Hitler's atrocities"
American Zionist Youth Commission, New York, 1940. Bibliopolarum corpori excudebat Guilielmus Stansbeius, London, 1617. First edition of the work on ancient religions which "quickly became celebrated outside England", established Selden's reputation for learning in Europe, and "remains a remarkable achievement, even when viewed through the lens of modern scholarship"
Printed by John Baskett, Printer to the King [etc. ], London, 1739. 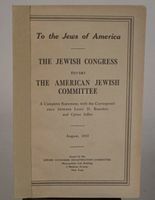 Jewish Congress Organization Committee, New York, 1915. Bloomsbury Book Auctions, London, 1997.